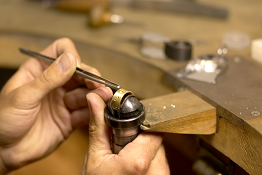 Our on-site jeweler has over 50 years of experience in jewelry repair and creation. Over time, your fine jewelry will need to some TLC. Being experts in all types of gold, platinum, diamond and gemstone jewelry, we will be able to maintain, restore or replace your pieces and make them look like new, all in a timely manner at affordable prices. … Whatever your needs are, bring in your pieces for consultation today and we would be more than happy to answer your questions.